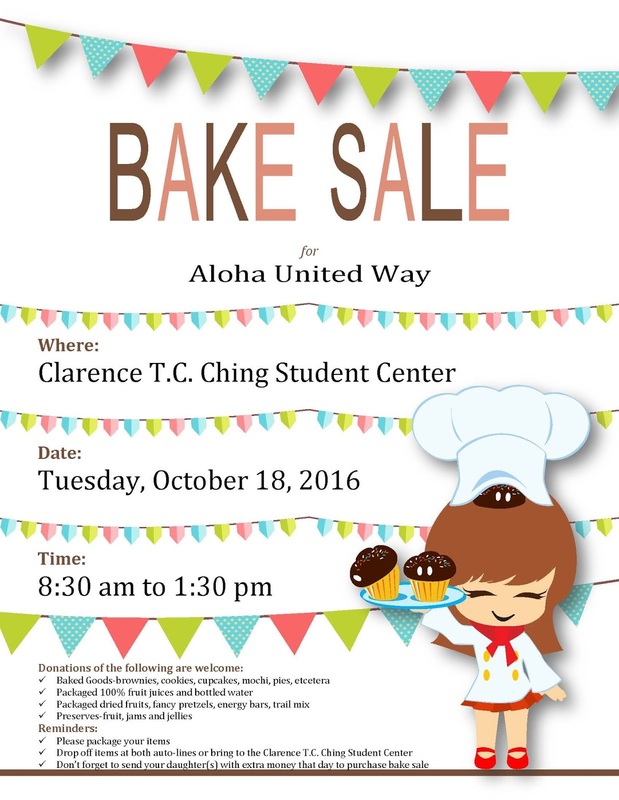 The annual Sacred Hearts Academy bake sale to benefit Aloha United Way will be on Tuesday, October 18, 2016 from 8:30 am – 1:30 pm in the Clarence TC Ching Student Center. Fun Fact! Did you know Sr. Katherine and Sr. Irene make the best pickled mangoes and pickled fruits every year? You have to be there bright an early to grab a jar - as they often quickly sell out in the first hour! The Student Councils of the lower and upper school are asking parents, alumnae and friends for donations of baked goods, healthy snacks, drinks, preserved fruits, jams and jellies, pretzels, etc. They may drop off their Non-Perishable Donations anytime beginning on October 1st in the lower school office. Perishable Donations may be dropped off the morning of the sale, October 18th from 7:00 am in both auto lines on 5th Avenue and Waialae Avenue. Parents are encouraged to send their daughters with extra money that day to purchase items for a good cause. Want to volunteer to help with the sale? Please email tching@sacredhearts.org for more information. Mahalo!